We can’t all be blessed with to die for brows like Cara Delevingne but we can steal the look with the help of the celebrity brow shapers, HD Brows. Well groomed brows work wonders on your face. But how do you get the perfect ‘WOW BROW’ for your face shape? HD Brows have the answer. Book in with an experienced HD Brow stylist who will offer a detailed consultation before your treatment to create bespoke brows that suits your face shape. A flattering brow shape can lift the eye area, enhance your natural features and give a more youthful appearance. Whether you’re growing back over plucked arches or need to shape bushy brows HD will help to get a ‘Wow Brow’ shape. 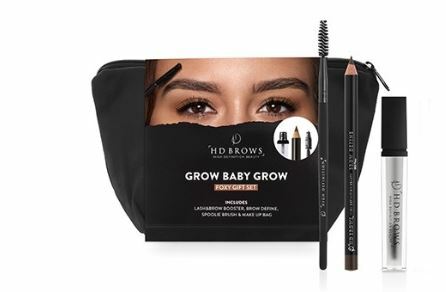 The kit includes; Lash & Brow Booster – Enriched with clinically proven, results-driven ingredients, this serum helps you to achieve fuller looking brows. Brow Define – The brow pencil you shouldn’t be without, this long-lasting pencil has a powdery finish for super easy application. Plus, the built in sharpener allows you to keep a sharp precision tip at all times. Spoolie Brush – Keep those hairs in place while they’re growing back with our trusty Spoolie Brush.